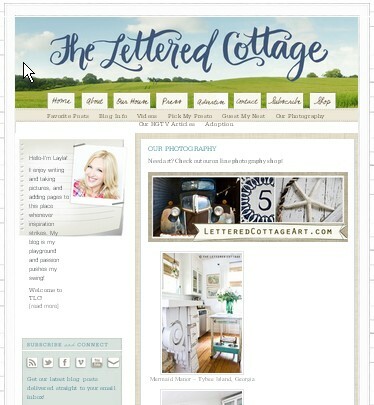 The Lettered Cottage blog is the personal blog associated with The Lettered Cottage Magazine. They are the brainchild of Layla Palmer, resident writer of Pike Road, Alabama. Where the magazine talks interior design and crafts the blog is where Layla talks about her house. Both are characterized by delightful writing and wonderful photography. I mean great photos. I am jealous. The great photos and the impressive production values should be expected. Both Layla and hubby Kevin are in the business. They shoot interiors for magazines, and produce articles for HGTV.com, among other things. They offer some of the more artistic fruits of their labors at TheLetteredCottageArt.com where you can buy prints of their photos. So why do I like The Lettered Cottage? 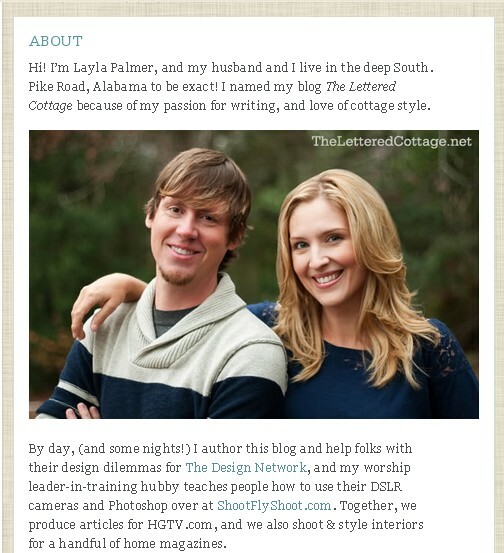 It is the young-couple-building-their-home-together type of blog that I like so much. Rather than presenting the perfect room after it is finished you see the not-so-perfect room as it gets better. Layla takes simple acts, like buying a door, and turns it into a story. In the process we learn some things about the storyteller. The content ranges from serious do-it-yourself to interior-decorator-at-the-store to discussions about up-coming projects. She is prolific, with several posts a week. You don't put out that much content and have every article tied-down, and well-researched but that is part of the beauty of this blog. You experience life at the speed of Layla, which is frankly much faster than I live my life. Layla writes as the projects arise. Her bookshelf project is on the top as I write this because that bookshelf was just built. That means it is a little hit-or-miss as you wind your way through the archives. But that can be a strength too. I recommend reading a storyteller's blog from the beginning. Skip the recent posts, and go straight to 2008, when she started this blog. Then you can grow with her as she tackles the project of making a house a home. That is probably asking a lot for the internet age, when we typically want our 3 minute read and then we move on to the kitten videos. Speaking of which, the other reason I am jealous is that they have videos. Nice videos. The kind I lack the skill and patience to make. 74 videos if Vimeo is to be believed. So what don't I like about it? I have to dig, because there isn't much to not like, but like any blog, organization is a problem. The newest articles are on the home page, but you have to dig a bit to find the past articles. They are hidden under small button called blog info, and then you still have to scroll down to archives. If you merely push the "blog info" button you come to a dead end. You need to hover and then scroll. It took me a lot of poking before I discovered the right combination of hover, scroll and poke. To wrap this review up, it is worth a visit, so please do. If you like it as much as I do, let me know. But don't be a stranger. We would love to have you back here at House-Design-Coffee again. Just because I'm telling you about all these great blogs doesn't mean I want to be parted from your company.